You can link your Minecraft account with your TeamSpeak identity to receive your in-game rank on TeamSpeak. If your Hive premium rank ever changes or expires, your TeamSpeak rank will change as well. You can only link one TeamSpeak identity to your account at the same time. To link the two together, log in to The Hive Minecraft server with the account you want to link, and join our teamspeak server at ts.hivemc.com with your own TeamSpeak identity. 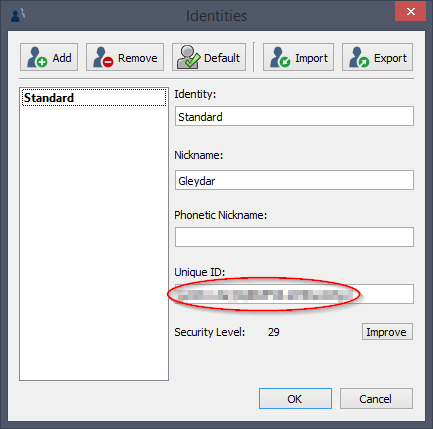 Replacing UID with the UID you copied from TeamSpeak. If all is well, you will get a "Link successful." message. If not, the error message will tell you what went wrong! If you ever lose your identity, you can restart this process with /teamspeak unlink. As mentioned above, you can only have one active link per Minecraft account at the time. If you regularly switch between computers/devices, export and import your identity! You can do this inside the Identities window, with the Import and Export buttons at the top right. NEVER SHARE YOUR IDENTITY FILE WITH ANYONE. IF YOU SHARE THE FILE, IT WILL ALLOW WHOEVER GETS THEIR HANDS ON IT TO IMPERSONATE YOU ON THE TEAMSPEAK SERVER, AND YOU WILL BE HELD RESPONSIBLE FOR ANY ACTIONS DONE WITH THE ACCOUNT. First of all: Open your TS3 and go to "Settings"
After that: Click on "Identities"
In game, use the command /teamspeak followed up with the text you just copied. You have to be online on the Hives TS. Now, you should probably copy some other text, so you don't paste your UID anywhere else on accident. All done! If you still have any questions regarding this or other topics, feel free to message any staff member!